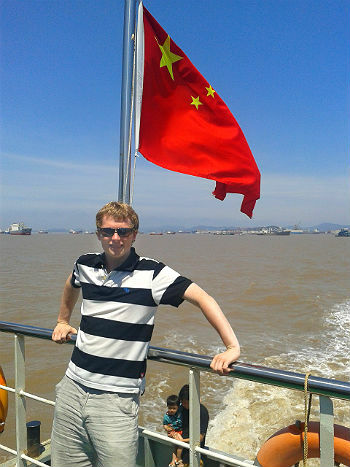 In our last post, we presented an inspiring story of a young guy called Chris Parker, who is a fluent Mandarin speaker. The post demonstrated that learning Mandarin Chinese can be easy if, like Chris Parker, you are prepared to work at it. Chris was born in Los Angeles to British parents, but was raised in the south of the UK. He started studying Mandarin in October 2006 after taking his first trip to Hong Kong and Beijing and becoming fascinated by the language and culture. In the first video, Chris discussed how his interest in learning Chinese began and the initial obstacles he encountered. In the second video below, Chris answers (in Mandarin Chinese) some of the questions that he often gets on his You Tube videos. He addresses questions related to the amount of effort he puts in to learning Chinese, the importance of correct pronunciation and how he became to be so fascinated with Chinese language and culture. Note: If you don’t speak Chinese yet and you want to know what Chris is saying in the video, you will need to read the English translation copied below the video. Hi everybody, I’m Chris. Thank you very much for everybody’s comments and support for my Youtube channel. In my other Chinese videos I have talked a little bit about my background and how my interest in Chinese started, about how I scared my teacher at school when I told him I wanted to study Chinese! I have also posted some videos about how to teach yourself Chinese. • Why have you put so much effort into learning Chinese? • Why have you put so much emphasis on accurate pronunciation? • Why are you interested in China and its culture? • Is it the culture that interests you? • Do think that Chinese characters are mysterious or interesting, or what? In fact, it is all of these. I have always been interested in Chinese culture, and other cultures and languages. At school I studied French, Spanish and Russian, and now I am quite rusty in them. and I stuck to it and continued my studies. So, when people meet me and they say your Chinese is really good, how did you learn it? I have to say It’s a long story, but at the end of the day, I just used Chinese every day and learnt it step by step. At the beginning, I took a university course, and studied a lot of things in textbooks, and travelled to China every summer to improve my level. Chinese became a part of my daily life. When I found words I didn’t know, I looked them up in a dictionary and revised them many times. I read newspapers, I read news websites, I watched many videos online. After I graduated from university I worked in China first for one year, and then I went back to London and worked as a full time translator and interpreter. During the training process, I listened to more than a hundred speeches in Chinese about economics, politics, society, history, finance etc, In other words I used my Chinese to learn about other topics and to increase my knowledge further. Now I still use Chinese in my everyday life, and it is a big part of my life, so Chinese is becoming like a second language to me now. I know that a lot of people don’t have as much time as me to learn Chinese, however more and more people are becoming interested in the language. Before I started learning Chinese, everybody told me that it is the hardest language in the world to learn, and how difficult it is, however, during my study, I have not found that Chinese is that difficult and compared to speaking fluent French or Spanish, it is not really more difficult and if you have time to practice, speaking fluent Chinese is a goal that can be achieved. I have found a lot of resources. I have found out how to use technology, whether it is computer software or a smartphone or an MP3 player, to learn a language more efficiently and quickly. Now, I want to share with everybody some of my study methods to help everybody to study Chinese. For this reason, I have set up a website to talk about my study methods. I am also developing my own beginners Chinese course to help students to build a good foundation in Chinese. Everybody is welcome to visit my website. If you have any questions or suggestions, then you are welcome to leave a comment below. I absolutely love your blog and find the majority of your post’s to be just what I’m looking for. Do you need guest writers to write content available for you? I wouldn’t mind composing a post or elaborating on many of the subjects you write related to here. Again, awesome web site!